My usual rule of thumb is that there should be one thing on the dinner plate that is fresh, as in a vegetable that is raw, crispy, uncooked, bright. It’s why we eat so much slaw in our house. Nothing cuts the richness of a pork chop quite the way a vinegary pile of cabbage can. But occasionally, we shake things up in the DALS house; I mean, what’s summer for if not for going off the rails a bit with the routine? To that end, last week, we decided to — hold on to your hats — grill the greens instead of take them for the usual dance in the salad spinner. Here is one of the mavericks below, tossing a fresh bunch of CSA curly kale with leeks, a little olive oil, salt and pepper in our grill basket. I can’t remember when we got this grill basket (here’s a similar model) but it’s come in handy through the years for more than just greens: We’ve used it for bok choy and asparagus; mushrooms and shrimp. Basically anything that can potentially slip through the the grill grate or that has to be thread on a skewer before cooking, which in my mind cancels out any ease you gain from the grill in the first place. 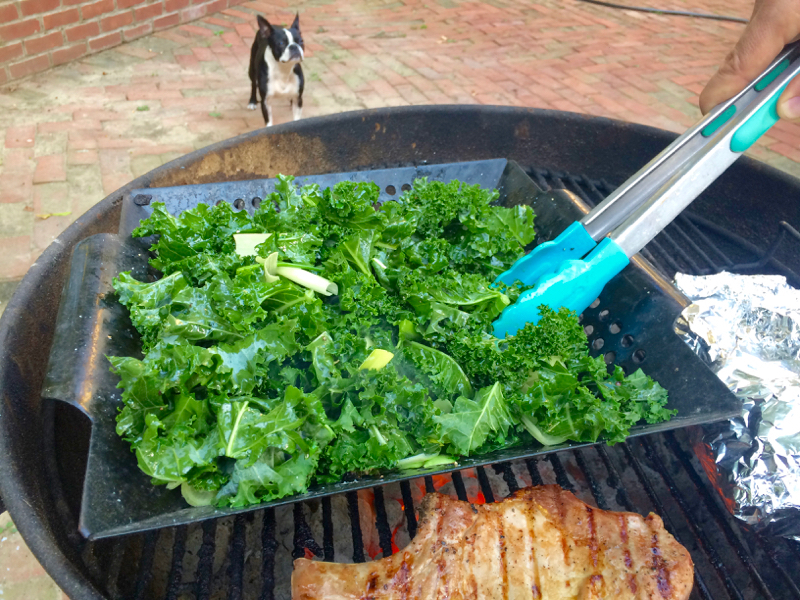 Anyway, we ended up eating the kale you are looking at above with soy-glazed pork chops (in my next book, sorry! Coming soon!) and it turned out so well that by the end of the week we were green-grilling fools, throwing broccoli rabe, Tuscan kale, and chard into the basket with abandon. (I told you: Off the rails!) It’s the chard you’re looking at way up top, draped on a piece of grilled bread that has been slathered with goat cheese, drizzled with a little olive oil, and sprinkled with sea salt and red pepper flakes. (I had just double-tapped this on instagram so the idea was top of brain.) 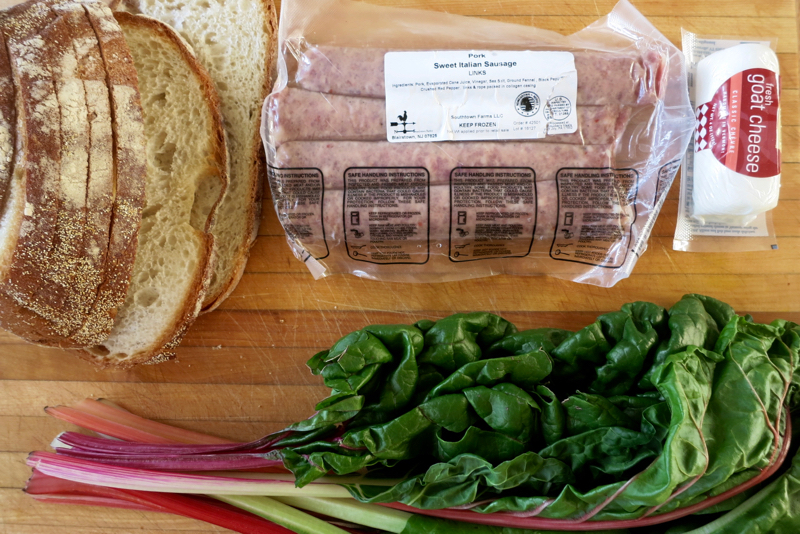 Alongside the basket, we grilled some A-game market sausages, served with my new favorite mustard, and called it dinner. Fifteen-minute, four-ingredient, zero-pot dinner. Am I dreaming? My husband and I discovered the very same wonder of grilled greens this past weekend! We don’t have a grill basket (yet) but we’ve been throwing pretty much any veggie we can land at the farmer’s market right onto the grate of our Weber grill. This past weekend, we grilled kale and then sliced it up and tossed it with grilled corn, grilled peaches, some cotija cheese, and a simple citrus dressing. It was amazing–and so fast! I still really want to get a grill basket for more delicate veggies, but when our large leafy greens were placed right on the grate, the edges got slightly crispy and the leaves got a wonderful char after just a few minutes. We’d been looking for something comparable to your “Accidental Broccoli” that didn’t involve turning on the oven and I think we found it! Thanks so much for all your great recipes! It looks so healthy and tasty! Thanks for sharing! Do you have to wash the grill grate after using it? That’s a key question for me! My partner and I just love using our grill basket! Diced zucchini has been a recent favorite, we’ve found a local farm that’s had a bumper crop of heirloom varieties. 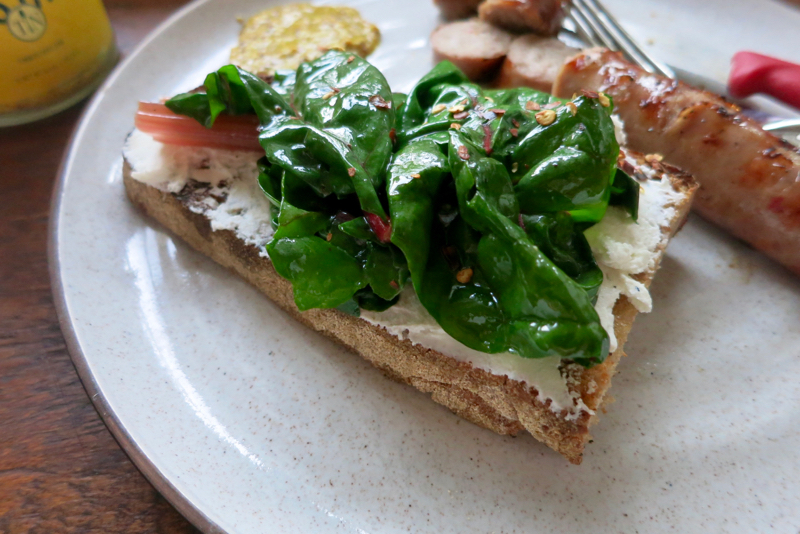 Adding goats cheese added a delicious and savory dimension! While we personally cannot eat meat because of my partner’s digestive issues, the sausage looks divine! a grill basket is on my need list. thanks for the reminder.